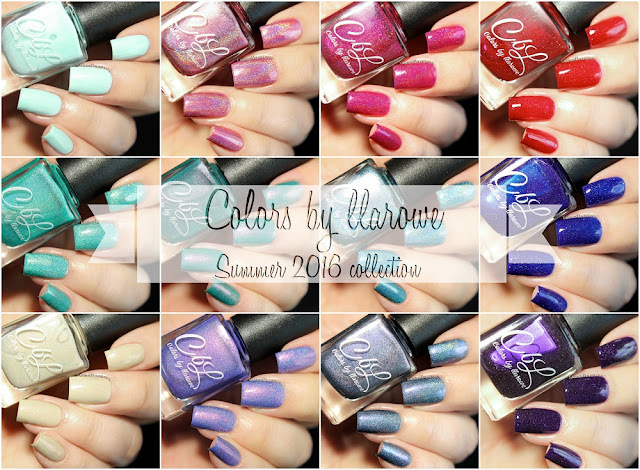 I'm back with the Colors by Llarowe Summer 2016 main collection. This is another picture heavy post so I'll try and keep my ramblings to a minimum. Fire Down Below is an ivory toned neutral with a faint scattered holo as well as copper to gold to red color-shifting shimmers. Formula was surprisingly easy to work with; making it an easy 2 coater. Prissy Little Thang! 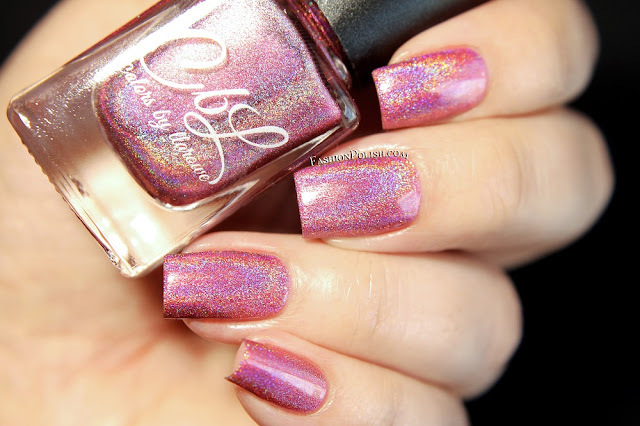 is a rosy pink, leaning lavender, with a strong linear holo. Great application and formula. I used 2 coats plus topcoat. Summer Lovin' is a hot pink jelly holo with holo flakes and iridescent microshimmer. A fun and delicious Summer color. I used 2 easy coats plus topcoat. Rendered Speechless is a milky bright minty green packed with copper to gold to pink color-shifting shimmers. A nightmare to photograph but a beautiful color with a delicate shimmer. I also used 2 coats plus topcoat and didn't experience any issues. Pool Partay! is a vivid pool water blue/green intense linear holo with a jelly formula. Easy peasy application and 2 coats used but 2 to 3 coats necessary depending on your nail length / coloring. Ahoy Matey! is a hunter green base filled with a violet to copper to gold color-shifting shimmer. A complex color, evocative of the ocean - sometimes aqua blue, sometimes green. One of my favorites and a totally unique polish. I used 2 coats plus topcoat but it's another 2 to 3 coater. Shiny Happy People is a periwinkle blue with a purple flash, scattered holo and an intense pink to copper to green color-shifting shimmer. Another must-have! 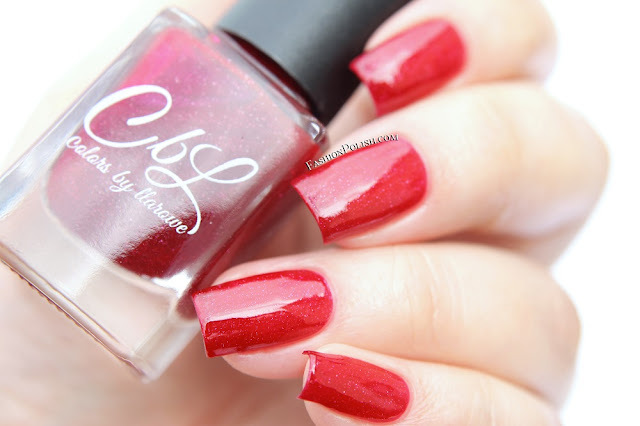 Formula was very similar to Ahoy Matey and I used 2 coats despite its 2 to 3 coats coverage. Bam! is a persian green intense linear holo with a turquoise flame. Perfect formula and 2 coats used for full opacity. 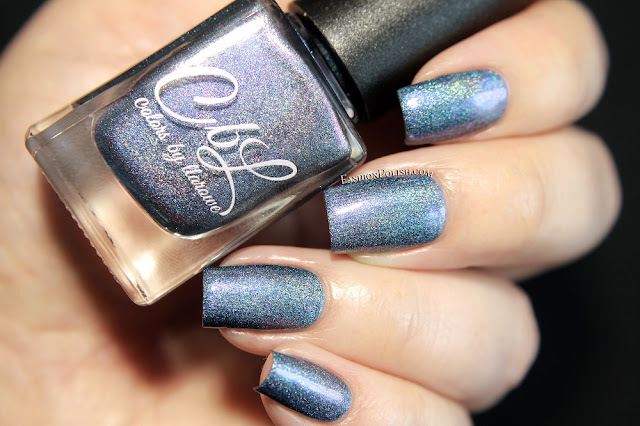 Annie Get Your Gun is an overall denim-leaning-teal scattered holo. It's a chameleon color so I'll just go ahead and give you the llarowe website description (no one describes it better than its creator!) "blue, green, gunmetal grey, purple with an added pink to purple to lavender sheen. Tightly scattered glowing holographic with arcs of green, yellow, gold, turquoise and purple". Highly pigmented, almost a one-coater. I used 2 thin coats plus topcoat. 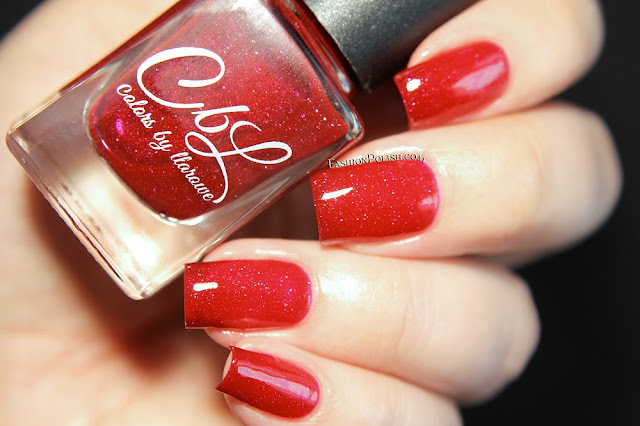 Fire to the Rain is a bright cool-toned candy apple red crelly, almost jelly, packed with silver microglitters. If you're a red person like me, you'll looove this one! I used 2 coats plus topcoat. Lisa's Revenge is a bright royal blue crelly, almost jelly, packed with silver microglitters. The microglitters really pop in this one. I used 2 coats plus topcoat. Stars at Night is a grape purple crelly, almost jelly, packed with silver microglitters. It reminds me of Twinkle Twinkle Little Star, so of course, I can only love it too! I used 2 coats plus topcoat but it looks like a 2 to 3 coater to me. So what do you think? Will you be grabbing any of these? My top faves : Ahoy Matey!, Shiny Happy People, Annie Get Your Gun, Pool Partay to only name a few. The Colors by Llarowe Summer 2016 collection is launching this Thursday, May 26th on llarowe.com (RPP $12 each).